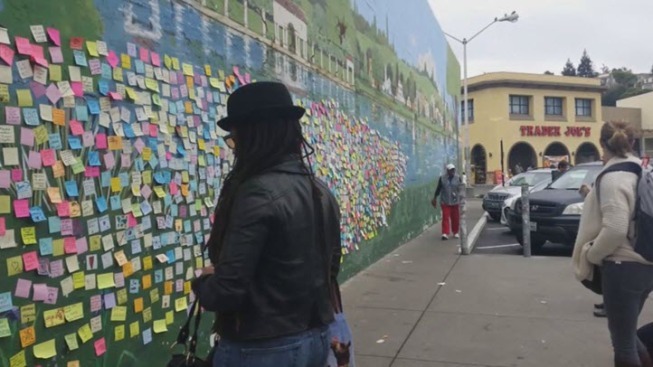 Hundreds of Post-it notes with messages of love have been ripped down in Oakland's Lake Merritt neighborhood. The so-called Love Wall spontaneously popped up on Lakeshore Avenue after Donald Trump won the presidential election. Pamela Drake with the Lakeshore Business Improvement District said a homeless man upset the notes were damaging a mural started tearing down the messages two days ago. "The person who did this to our wall of hope and resistance, which is what I was calling it, is like the Grinch who stole Christmas," Drake said. "He is the Grinch that stole hope from Lakeshore." Drake said the homeless man claims he painted the mural, which is actually the work of artist Peter Lee. "It was one thing that made me feel better after the election," resident Thorild Urdal said. "It breaks my heart." Meanwhile, around the corner on a nearby wall a new Love Wall is popping up. "We had the hands around the lake, but that lasted a couple of hours," Drake said. "This last for days, so it was worth it event if it's gone now."